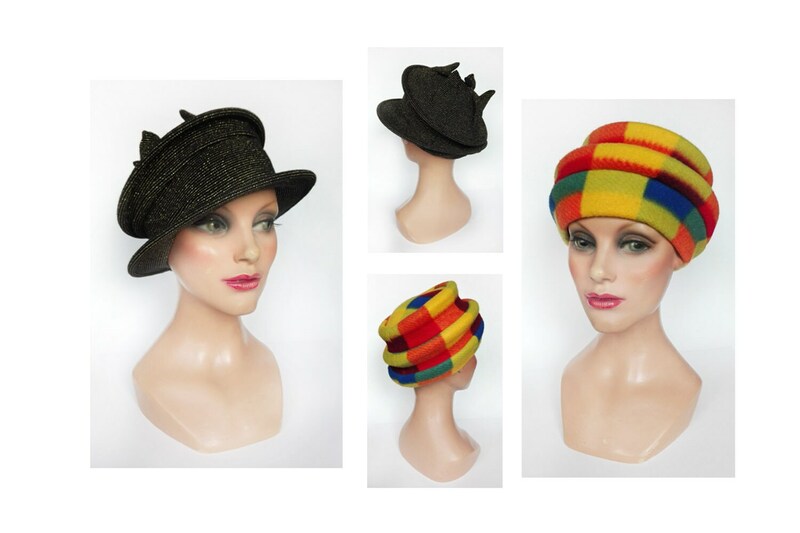 The multicolor version: Hat winter woman, hat made in fabrics fleece with yellow, orange, blue, green, red plaid pattern. Foldable hat that could be compared to a slap Hat frame on three levels, deadstock, it has the volume of a cake. Fits a head circumference between 55-56 cm. For the black version: this is a pretty hat, hat frame to brighten up the sad winter days. The cuff is made with fabrics Black jersey with presence of liserais gold. You can play with the tilt of the edge to have different depictions. This hat fits a head circumference of 55 centimeters. Whether for everyday or for any special occasion, this Hat will go unnoticed... but also for a loved gift suggestion. Shipping is done in tracking, unless specification on your part of a mode of shipping that is unique.